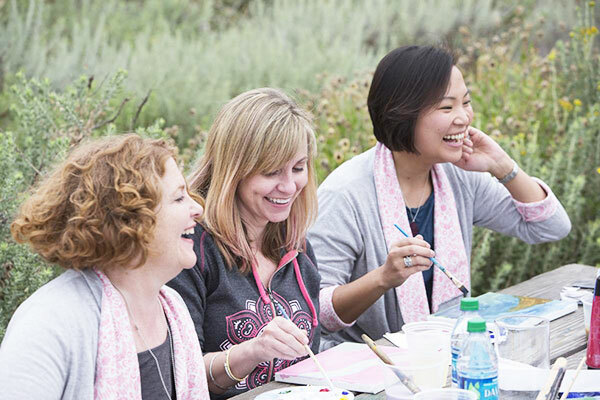 Tag Archive | "Meal Train"
Left to right: Models of Courage Laurie Tennent, Cati Diamond Stone, and Aimee Bariteau join together in a group painting session as part of Ford Warriors in Pink’s Good Day Project. To learn more, visit Fordcares.com. (BPT) – When facing bad news—like something as serious as a cancer diagnosis—it can be difficult to imagine that any day of the coming journey would be “good.” But for many of the millions of men and women in the U.S. who have been affected by the disease, the experience has transformed their understanding of support and redefined their sense of normalcy. Survivor Karen Martinez was prepared to go through chemotherapy alone, but was thankful to have two friends who insisted they be at her side for every appointment, which sometimes lasted five to six hours. Other survivors found peace in solitude. 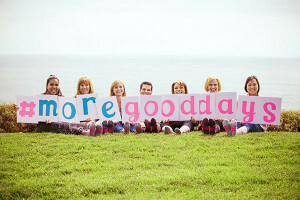 20 breast cancer survivors and co-survivors join Ford Warriors in Pink’s Good Day Project to share their stories and give more good days to others affected by breast cancer. Both experiences underscore the complexity of support. While many people want to help, they’re unsure of the best way and what comforts one person might not work for another. Instead, Tracy Nicole’s family and friends helped with things like organizing meals, childcare and other household errands. Through the online platform Meal Train, Jenny Price, Tracy Nicole’s friend, organized a calendar and identified specific errands that friends could help with on certain days and times, including ironing her daughters’ school uniform or preparing meals for the day. Insights like these from breast cancer survivors and co-survivors inspired Ford “Warriors in Pink” to launch The Good Day Project, an initiative to help friends and family take small, actionable steps that will bring more good days to breast cancer patients. Celebrate small victories: Aimee Bariteau recalls the simple joy she got from being able to walk to the park for the first time after treatment. “Rather than being annoyed that I couldn’t do it before, I was happy when I could do it. It’s a long haul, so when something good happens, be sure to acknowledge and enjoy it.” Fellow survivor Camari Olson documented her surgeries and hair regrowth after chemotherapy in a photo project that she looks back at to remind herself how far she’s come. Share your experience and advice with others: Steve Del Gardo says this is especially important for men with breast cancer, as there are fewer support resources dedicated to the male experience. He volunteers as a Peer Support Navigator through the Friend for Life Network to support other men affected by the disease. Remind your loved one that you’re thinking about them: Take five minutes to send a postcard. Survivor Cati Diamond Stone enjoyed receiving random cards from her friend on a weekly basis. Free Warriors in Pink postcards are available at fordcares.com or at their website. Remember your loved one’s interests are probably still the same: While help with physically taxing tasks (laundry, driving, groceries) are much appreciated, don’t assume your friend or loved one doesn’t want to be invited to something they can’t fully participate in. If they love hiking, for example, consider a route that allows them to enjoy a scenic break.